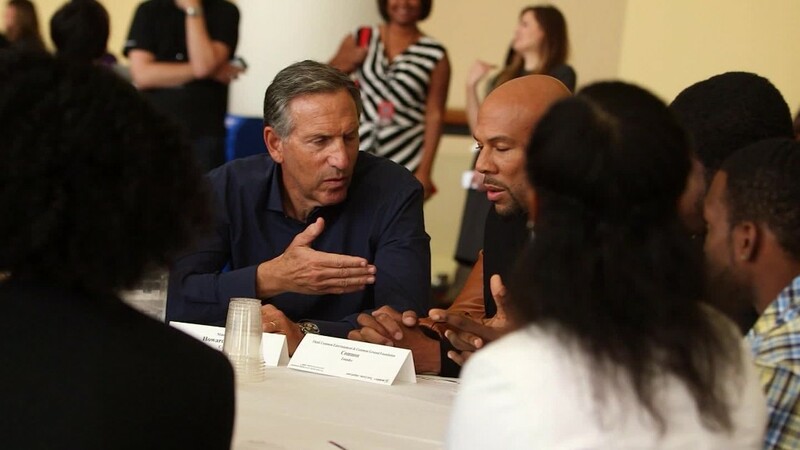 Young adults growing up under tough circumstances now have two powerful allies: Howard Schultz, the head of Starbucks, and Common, the Grammy-winning hip hop artist. The duo hosted the kickoff 100,000 Opportunities job fair in Chicago on Thursday for more than 3,000 disadvantaged youth. Participants got the chance to network with 29 employers and to learn resume and interview tips from community groups. Hundreds were expected to get jobs. Both men, who themselves rose up from difficult childhoods, say it's time to restore the next generation's hope. Their main concern: The 5.6 million youth, most of them black or Latino, who are not in school and not working. "When I grew up, the promise of America and the American Dream wasn't just a slogan and words," said Schultz, who was raised in housing projects in Brooklyn, N.Y. "You really felt as a young kid on the other side of the tracks that that was available to you. I ask myself ... is it as relevant and accessible to those kids right now as it was when I was coming up. The sad answer is no." Common, through his Common Ground Foundation, offers mentoring, summer camp and college readiness programs for underserved youth in Chicago, his hometown. His foundation hopes to expose these kids to new outlets through the creative arts. "Creating opportunities for young people will create a better world for everybody," said Common. "A job and an opportunity gives a person hope."